Quadrant has added a polyamide product to its portfolio of engineering plastics to fulfil the requirements for flame-retardant plastics in aircraft construction: Nylatron® FST. Specifically designed for aircraft interior, it is the first technical plastic product of its kind, which fully meets the flame-retardant requirements for materials used in the cabin. The material complies to the Federal Aviation Regulations FAR 25.853. Nylatron® FST (Flame, Smoke, Toxicity) withstands temperatures of up to 175 °C and is produced as a semi-finished product in the form of bars and plates. It is particularly suitable for any type of application in aircraft where traditionally metal parts (e.g., brackets, gaskets, slide rails and canal seals) or high performance polymers have been specified so far. Another new feature: Quadrant's new range of special composites suitable for use in structural aircraft construction - the Quadrant HLS Series (High Load Solutions). These special composite materials are carbon fiber reinforced composites [Ketron® CC PEEK, Duratron® CC PEI, Techtron® CC PPS, and KyronMAX(TM), which are available in various thicknesses and geometries and offer endless design possibilities to engineers. 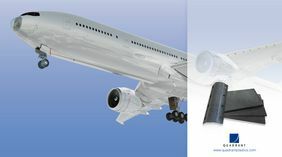 Frank Johänning, Global Market Manager for Aerospace Technology at Quadrant EPP comments "These materials achieve metal-like mechanical properties and combine all the advantages of thermoplastic polymers, such as corrosion resistance and recyclability. The market has been waiting for this development for more integration of advanced engineering polymers in aircraft." During Aircraft Interiors 2017 Quadrant will present its complete range of thermoplastic polymers for the aviation industry. From cryogenic to very high temperature resistance, Quadrant offers the widest range of engineering and high-performance plastics. The Quadrant materials are certified and approved according to AS9100C, ISO 9001, ISO 14001, OEM Approvals and JAR / FAR 25.853. In addition, Quadrant combines extensive engineering expertise and in-depth application knowledge across a wide range of bearing, wear and transmission components for major aircraft assemblies such as interiors, propulsion, systems and structures. Duratron®, Ketron®, Techtron® and Nylatron® are registered brands of the Quadrant Group. KyronMAX(TM) is a registered brand of Piper Plastics Inc.